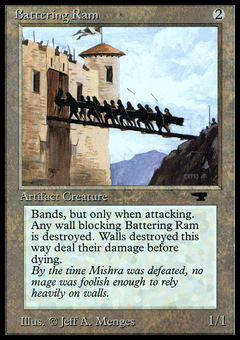 Battering Ram ($0.39) Price History from major stores - Antiquities - MTGPrice.com Values for Ebay, Amazon and hobby stores! 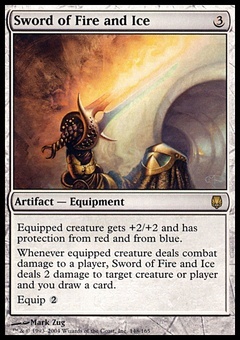 Card Text: At the beginning of combat on your turn, Battering Ram gains banding until end of combat. (Any creatures with banding, and up to one without, can attack in a band. Bands are blocked as a group. If any creatures with banding you control are being blocked by a creature, you divide that creature's combat damage, not its controller, among any of the creatures it's blocking.) Whenever Battering Ram becomes blocked by a Wall, destroy that Wall at end of combat. 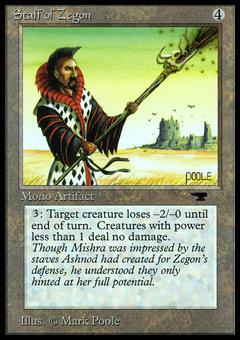 Flavor Text: By the time Mishra was defeated, no mage was foolish enough to rely heavily on walls.